If a member is lapsed for a considerable period of time, you might want to remove the person from your contact database so that they no longer count towards your database limit. Rather than deleting the member's contact record, you can archive the record so it can be restored at a later date. Archived records are automatically excluded from receiving emails and do not count towards your database limit. Once archived, a record can be deleted at any time. Deleting contacts will permanently remove them from your Wild Apricot database, along with their event registrations and invoices. Archiving a contact will not affect any current event registrations. When you archive a bundle administrator, all members of the bundle will be archived along with the administrator. After archiving, you can restore bundle members individually. You can archive contact records one at a time or in bulk. You can also set the renewal policy for your membership levels so that members are automatically archived if they don't renew their membership within a certain number of days. For more information on automatically archiving members as part of your renewal policy. Only full administrators and membership managers can archive and delete contacts. For more information, see Site administrators. To delete a single contact, you start by archiving the contact record. An archived record can restored at a later date, unlike a deleted record. 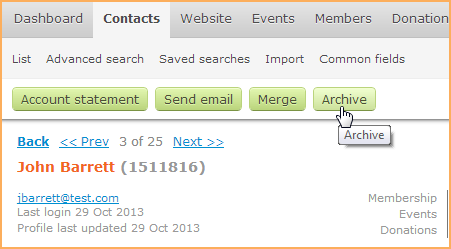 To archive a contact record, display the contact record then click the Archive button. With the record archived, you can now delete it by clicking the Delete button. You will be asked to confirm your request to delete the record. Click OK to proceed with the deletion. Instead of deleting the archived record, you can restore it by clicking the Restore from archive button. You can archive multiple contacts by importing a properly formatted spreadsheet. Once contacts are archived, you can delete all archived records. Contacts with administrative permissions are excluded from bulk archiving. You must archive these contacts one at a time. Export the contacts you want to archive to a spreadsheet. Open the spreadsheet in Excel and set the Archived column to Yes for the contacts you want to archive. You cannot archive a contact through import if the contact has recurring payments enabled. You must first cancel the recurring payments. 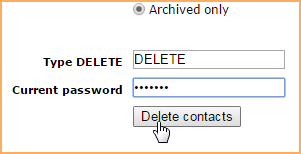 Deleting contacts will permanently remove them from your Wild Apricot database. From the Account screen, click the Delete all contacts button. Click the Archived only option. Type the word DELETE in the field provided. Enter your password in the field provided. Click the Delete contacts button. You will be asked to confirm your request to delete the selected records. Click OK to proceed with the deletion. 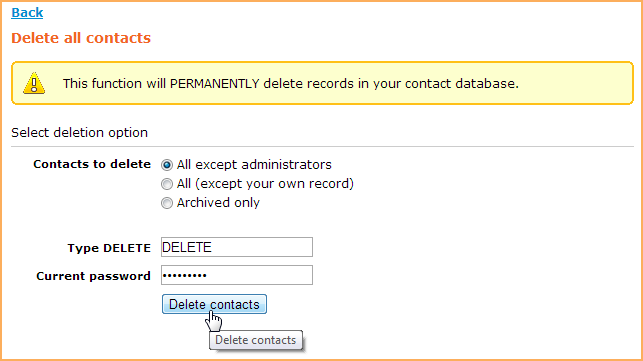 Choose whether you want to delete all contacts except administrators or all contact records except your own. Normally, archived records do not appear in your contact list. 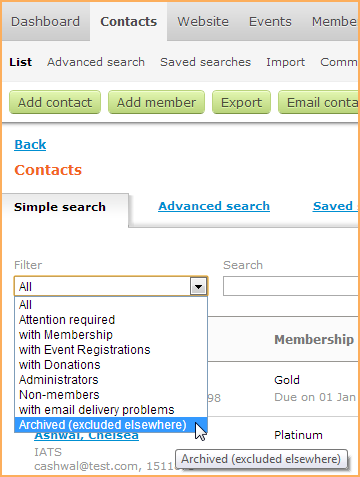 To view a list of archived records, go to the simple search page in the Contacts module and select the Archived filter. 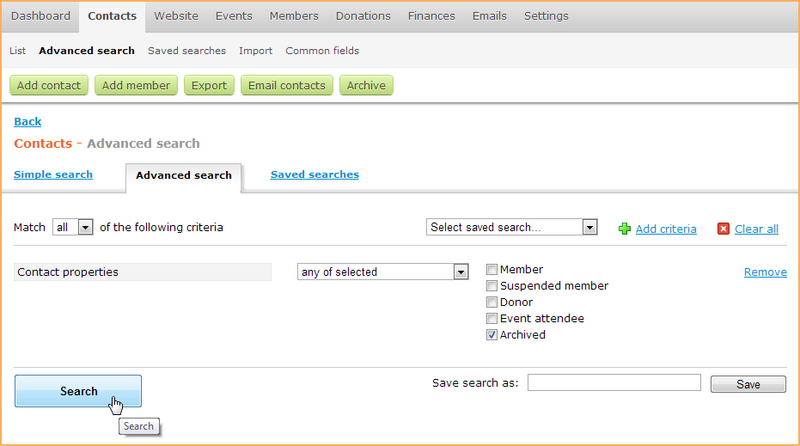 You can also use an advanced search to search for archived contacts. When you add Contact properties to your search criteria, you can limit the search to archived contacts, and further limit the search to archived members. To view the archived record, click it within the search results. Once a contact record has been archived, the Archive button on the contact details tab is replaced by a Restore from archive button. Clicking the Restore from archive button will restore the contact record from archived to active status. You can also restore archived records in bulk using Wild Apricot's exporting and importing functions. Within the spreadsheet, set the Archived column to No. Archived contacts are automatically restored when they log in to your Wild Apricot site, register for an event, apply for membership, make a donation, or subscribe to a forum or forum topic. If the contact is a member, their membership will be restored in Lapsed status. Archived contacts are not automatically restored if they pay an invoice without logging in, by clicking the link in the invoice email. In the following example, the contacts to be restored were archived together on January 18, 2017. Click the Search button to perform the advanced search. From the list of your archived contacts, click the Export button. On the Export contacts dialog that appears, check only the following fields to be exported: User ID, Archived, Membership enabled, Membership level, Membership status, Renewal due. Open the exported spreadsheet file in Excel or any other spreadsheet program, and change the value of all Archived cells from yes to no, and the value of Membership enabled cells from no to yes. Do not modify the Membership enabled cell if it is blank. Save the changes to your spreadsheet file. Within Wild Apricot, import the spreadsheet file you just updated. For instructions on importing a spreadsheet, click here. Once the import is complete, your contacts will be restored, along with their previous membership and membership status.